Bidar town enjoys a picturesque situation having been built on the brink of a plateau and thus commanding lovely views of the low lands (Talghat) towards the north and the east. The plateau is an irregular oblong 22 miles in length and 12 miles extreme breadth with an area of 190 sq miles , observed G. Yazdani in 1944. Bidar town is situated about 740 Km north of Bangalore, 116Km northeast of Gulbarga and 130 Km northwest of Hyderabad. The History of Bidar goes back to the days of the Mahabharata epic. It must have existed as a minor but powerful fort during the days of Kalyana Chalukyas (AD 1074- AD 1190). It passed on to the control of the Kakatiyas of Warrangal. In A.D.1322, Prince Ulugh Khan captured the town of Bidar. Subsequently, it was annexed by Sultan Muhammad-bin- Tughlaq of Delhi. With the establishment of the Bahmani dyanasty (AD 1347), Bidar was occupied by Sultan Alla-Ud-Din Bahman Shah Bahmani. During the rule of Ahmad Shah I(1422-1486 AD), Bidar was made the capital city of Bahmani Kingdom. The old Hindu Fort was rebuilt and beautiful palaces and gardens were raised. Mahmmad Gawan who became the prime minister in 1466 A.D. was a notable figure in the history of Bidar. Bidar remained under the Barid Shahi dynasty until it was captured by the Mughal emperor Aurangazeb in 1656 A.D. In 1724 Bidar became a part of the Asaf Jahi Kingdom. introduced into India by the Muslims. · The walls, bastions, gates and barbicans of Bidar are some of the most sophisticated in India still intact. · The Munda Burj is the most prominent bastion, commanding the approach with heavy guns. · The old town has five gates, namely, the Fateh Gate on the south, with octagonal towers and drawbridge; the elevated Talghat Gate in the east; the Sharzu Darwaza (the 2nd gate); the Delhi Gate ; and, the Mandu Gate. · Khwaza Mahmud Gawan, the Persian scholar and the General of Mohamad Shah III, founded the Madrasa in 1472. It is a marvelous three-storied building with monumental minarets, great arches, and brilliantly colored chevron tilework. The domes over the main chambers were the first in India to take the characteristic Timurid bulbous form, typical of the 16th century. · Bidar has two prominent Mosques – the spacious Jami Masjid and the Sola Kumbha Masjid with a remarkable dome on a 16-sided drum. · The imposing black granite steps, striking amid red sand-stone leading to Gagan Mahal, (Public Audience Hall), glazed mosaics and lovely arabesque designs in the Rangin Mahal of Ali Barid Shah, the high art of Quranic calligraphy, bright painted murals in the zenana, the Lal Bagh, the Takhat Mahal, the 70 ft. Chaubara, the Watch Tower dominate the town. · The tiled tombs of the Barid Shahis, are outside the town walls, but are well-preserved. · Bidriware, a delicate metal ware containing silver and gold inlaid on iron is a very popular art form in Bidar. 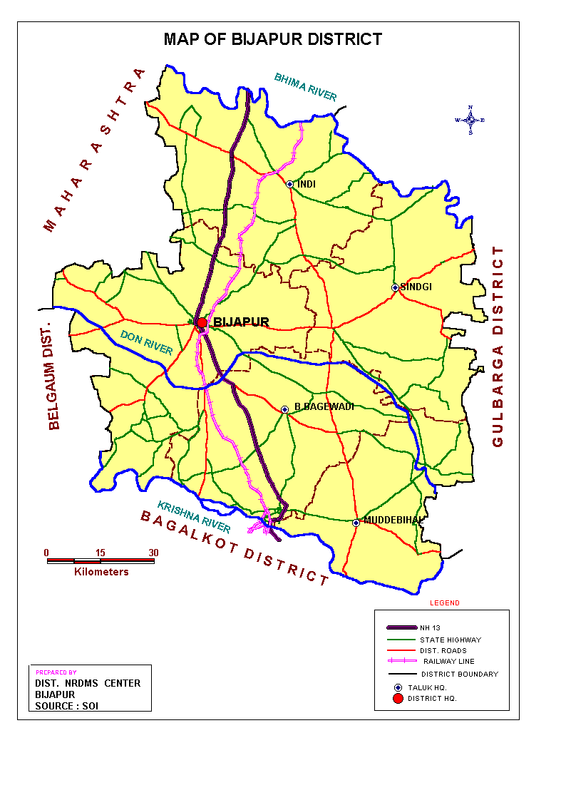 · Gulbarga city is the head quarters of the Gulbarga district, and also of the division . This rapidly growing city is situated on the Madras-Bombay railway. It is at a distance of 363 miles from Bangalore. · For nearly 1500 years or more the district of Gulbarga or Kalburgi has had its influence on the historical and cultural life of the Deccan Plateau. The antiquity of many places in the district may be traced to legendary period of Indian history. Several of the important ruling dynasties of the Deccan had their capital in this district. The capital of the Rashtrakutas was at Malkhed ; the later Chalukyas and the Kalachuris had their capital at Kalyana ; and , Gulbarga City itself was the capital of the Bahmani kingdom from 1347 A.D.
· A Muslim dynasty that ruled over northern parts of the Deccan initially from Gulbarga and later from Bidar were the Bahman Shahis (A.D.1347-A.D. 1527). The dynasty, founded by Alla-ud-din Hasan, ruled over a kingdom that extended from the river Krishna in the south to the Penganga in the north, and thus included parts of modern Karnataka, Maharashtra and Andhra Pradesh. The greatest among the Bahman Shahis was Firuz Shah (1397-1422). His son Ahmed Shah(1422-1436) was a ruler with saintly temperament . The dynasty reached its most glorious epoch during the administration of Mahmud Gavan, the prime minister of Sultan Alla-ud-din(1436-1458). · The most magnificent contribution of the Bahmanis was in the field of art and architecture. The buildings that they have left at Gulbarga, Bidar and other places have an important place in the history of Indo-Islamic art. Under the Bahmanis the Deccani style asserted its individual character and reached its zenith under the Adil Shahis of Bijapur. · The Gulbarga city is located on an undulating plain, presenting a vast stretch of black cotton soil. It has been the head quarters of the district since 1873. The Gulbarga Fort, originally built by Raja Gulchand and afterwards strengthened by Ala-ud-din Bahmani is a fine work. 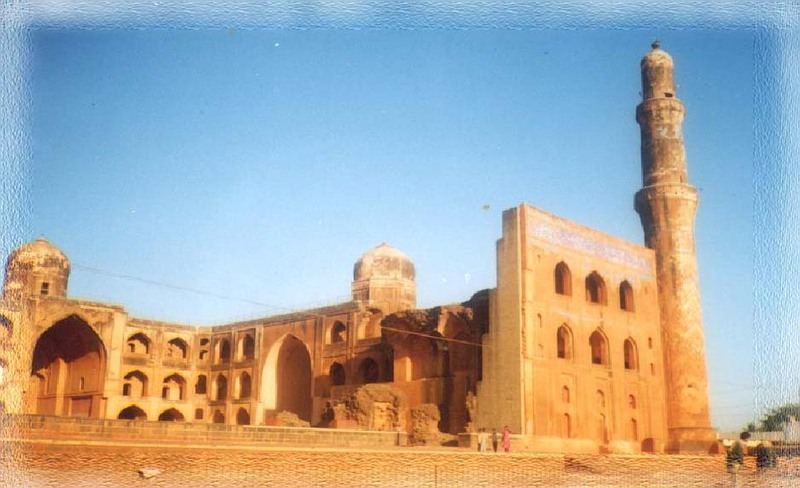 · Within the ramparts is the earliest of their buildings, the Jami Masjid (1367), which shows Hindu influence. Sultan Hasan’s tomb is typical of the Tughlaq style. · The tomb of Ghias-ud-din(14th century) shows Hindu influence in the carvings of the prayer niche attached to it. · The fine mausoleum of Firuz Shah and his family also bears testimony to the growing strength of Hindu influence as well as to the new preference for Persian. · The Shah Bazar Masjid, built by Muhammed Shah is a simple structure in imitation of Tughlaq architecture. Bidar is a walled fortress town lying 673 metres above sea level on a red laterite plateau in northern part of the Indian state of Karnataka. Although only a small regional centre today, it was once a flourishing capital of two major Sultanates of the Deccan – the Bahmanis and the Barid Shahis. The ninth ruler of the Bahmani kingdom, Ahmad Shah I, shifted his capital from Gulbarga to Bidar in 1424. He rebuilt the old Hindu fort to withstand cannon attacks, and laid out beautiful palaces and gardens. As the Bahmani capital declined, the Barid Shahi family took over the reins of the state from 1487. They continued to hold power till 1619, when Bidar was annexed to Bijapur. The town and the surrounding area fell to Aurangzeb in 1656. The Asaf Jahi dynasty, founded by Nizam-ul-Mulk took over Bidar. It continued as part of Hyderabad state till 1956, when it became part of the expanded state of Mysore, later named Karnataka. Although Bidar’s period of glory lasted for less than 200 years, it still attracts travellers with its haunting beauty, modesty and lack of pretension as well as old-world charm. It lies a little over 100 kilometres to the northwest of Hyderabad, and about 25 kilometres north of Mumbai-Hyderabad national highway. The main monuments are the Fort and some other buildings erected by Ahmad Shah Wali in 1429. The Fort owes its construction to Allauddin Bahmani in the 14th century AD. The moat is its most remarkable feature. The fortifications, built by Turkish mercenaries, possess a certain resemblance to medieval European fortresses. This is seen in the disposition of barbicans, covered passages and bastions. However, local features such as labyrinthine secret passages, carved stones and dainty architectural details are also to be seen here. The inner Fort was built by Mohammad Shah out of the red laterite and dark trapstone available in the area, and it was later decorated by Ali Barid. The steep hill to the north and east provided a natural defence, and a triple moat was built to the south and west. A series of gates and a drawbridge over the moat to the south formed the main entrance from the town. One of the other two gates is the Sharaza Darvaza, built in 1503. It has tigers carved in bas-relief on each side and a Naubatkhana (drum gallery) above it. The other one is Gumbad Darwaza, which shows Persian influence. It has a decorated gumbad or dome, and is said to have been built by Ahmad Shah Wali in the 1420s. The palace of Ahmad Shah Wali still boasts of some remarkable architectural features. The Rangeen Mahal of Muhammad Shah has elaborately coloured tiles, and mother of pearl inlay on polished black granite. On the western side of the square is the Shahi Mathak, or kitchen (once a palace); the Shahi Hamam or bathhouse, converted into a small museum, and an old banyan tree. The remains of water channels and a fountain are witnesses to the former glory of the Lal Bagh. Perhaps the oldest Islamic-style building in Bidar, and also one of the largest, is the Sola Khamba (sixteen columned) mosque, also known as the Zanani mosque, which dates back to 1423. The adjacent Tarkash Mahal, to the south of Lal Bagh, still has some tilework. The Gagan Mahal, the Diwan-i-Am and the Takht Mahal are other buildings worthy of a visit. Of the royal apartments, a well, part of the Hazar Kothri (underground rooms), and the Naubat Khana are among the few buildings which survive. The Madarsa of Mahmud Gawan is one of the most ambitious pieces of medieval architecture in India that still survives. It was built around 1472 by a man who held the high post of Vazir (Prime Minister) to three Bahmani rulers, and who was reputed to be a warrior, statesman and scholar. His military campaigns had added most of the present day Karnataka and Goa to the Bahmani kingdom between 1466 and 1481. Goa, however, fell to the Portuguese in 1510. The Madarsa was a famous college and centre of learning, which attracted scholars from distant Muslim lands. It has been described as a copy of a similar building in central Asia; in any case it is a brilliant example of Persian influence on the Bahmani architecture of the period. Green, white and yellow tiles once covered the whole facade, with floral patterns and bold calligraphy. Among the other structures of interest are the Chaubara, a circular watch tower, 23 mt high, near the city centre. Close by is the Jamai Masjid, built in 1430. It bears the Barid Shahi chain and pendant motif. Another mosque worthy of note is the Kali Masjid, built in 1694, south of the Talghat Darwaza. It has fine plaster decorations on the vaulted ceiling, and is made of black trapstone. There are also a number of Khanqabs (hospices), which may be described as Sufi versions of an ashram or monastery. Some of them are still in use. Another interesting group of buildings in Bidar comprises of tombs and shrines at Ashtur, which were erected by Bahmani kings from 1436 to 1535. It is significant that the Bahmani tombs are quite distinct and located away from those of the Barid Shahi rulers, who usurped power from the Bahmanis. They are square, with arched arcades all around. The interiors have coloured and gilded paintings of great beauty on the ceilings, while the exteriors have bulbous domes, stone carvings, and decorations with coloured tiles. The two most impressive are those of the ninth and tenth Bahmani rulers, Ahmad Shah I and Allauddin Shah II. A very attractive building is the Chaukhandi of Hazrat Khalillulah, a spiritual adviser to the rulers. This is approached by a flight of steps. The Barid Shahi tombs and mausoleums constitute yet another group of buildings in Bidar. Some of the lesser Barid Shahi tombs have been enclosed in a compound and gardens have been laid between them in somewhat dramatic style. The stress appears to be on the trees and flowers and not on the monuments! The Habshi Kot, outside the city walls, was a site of important Abyssinian officials. The Narasimha Jharani is an underground cave temple, with a spring nearby. Bidar reminds of a medieval city which played an important part in the history of the Deccan. It is a symbol of the harmonious culture which prevailed at the time, in spite of the dominance of Islamic rulers. The author, Dr. Vasant Kumar Bawa, is a freelance writer. 231 B.C The Satavahanas who were ruling at Paithan as vassals of Mauryas proclaimed independence. They ruled over Dakshinapatha for about four centuries and a half. The Vakatakas dominated the Deccan. 1075 A.D Kakatiya Beta II received Sabbinadu from Chalukyas. 1154 A.D Kalchuri Bijjala became the Mahapradhana to Taila III. 1155 A.D Bijjala Started carrying on the administration in the name of Taila III. 1157 A.D Kalachuri Bijjala assumed full imperial titles. 1167 A.D Bijjala abdicated the throne in favour of his son somideva or someshvara. 1181 A.D Somesvara IV the son of Chalukya Taila III became ruler after sweeping away the last remnants of Kalchuri power. 1188 A.D Yadava Bhillama seized Kalyana. The Kakatiyas also gained some territory of chalukyan empire as a result of the final dissolution of Chalukyan hegemony. 1320 A.D Kakatiya pratap rudra reoccupied Badarkot and other places. 1322 A.D Bidar Town which was on the frontier of Telingana and Baswakalyan forts were taken by Ulugh Khan(Muhammad-Bin-Tughluq) who was then a prince. Those town fort were left incharge of trust worthy officers with strong garrison. 1336 A.D The Vijaynagara empire founded. 1341 A.D Muhammad Bin Tughluq honoured Shihab-Ud-Din of Multan with the litle Nusrat Khan and conferred on him the Government of Bidar( One of the aqlims or provinces) with its dependencies on the condition that he should pay a revenue of one Crore of rupees annually into the kings treasury. 1345 A.D As Nusrat Khan could not fulfil the condition, he was expelled. Sadah Amirs (who were revenue collectors as well as military commanders under Mohd. Tughluq) rebelled. They elected one of their members Ismail Mukh as the sultan of Deccan. As he was aged, he readily abdicated his charge in favour of Hasan Gangu. 3rd August 1347 Zafar Khan (Hasan Gangu) was crowned and assumed the title of Ala-Ud-Din Hasan Bahman Shah at Daulatabad. He made Gulbarga his capital. Bidar was made a taraf/province under a governor. The Bidar town began to flourish as a provincial head quarters. 1378-1397 A.D Muhamad II established some schools for orphans at Bidar. 1396 The Durga Devi Xamam; a famine that lasted for 12 years and ruined the country between the Godavari and the Krishna. 1428 A.D On his return from Kherla, Ahmed stayed in Bidar for some time, where he was struck by its situation and climate that he decided to build a new city near its ancient fortress and called it Ahmadabad-Bidar. 1436-1458 A.D Ala-Ud-Din Ahmed-II . He built a large hospital at Bidar and staffed it with expert Muslim and Hindu physicians. 1453 Mohammed Gawan’s arrival at Bidar. 1458-1461A.D Humayun was the sultan. He appointed mahmud Gawan as the Prime Minister, Commander-in-Chief and governor of Bijapur. 1461-1463 Nizamud-din-Ahmed II 1463-1482 Muhammad III Mahmud Gawan. Prime Minister, introduced many reforms, Great Madarsa of Mahmud Gawan was found by Gawan in 1472 A.D, Goa annexed to Bahmani Kingdom. 1471-1474 A.D Afanasy Nikitin a Russian Traveler was in the Deccan including Bidar. 5th April 1481 On the order of the monarch Muhammad III, mahmud Gawan was beheaded at Kondappalli Camp. 1523 A.D As Bahmani Sultan Alaud-din Shah was venturing to assert himself, he was dethrouned by Amir Barid. 1538 A.D The Bahamani dynasty faded out of history. Five smaller states emerged including Barid Shahi dynasty. 1543 A.D Ali Barid assumed royal appellation of Shah. 1619 A.D The Adil Shah of Bijapur took over Bidar. 1656 A.D The Mughal forces captured Bidar and Kalyani. Bidar was annexed to the Mughal empire. 1724 A.D Asaf Jahi Dynasty succeeded Mughal rule. Rule by governors. 1867 A.D “Bhalki conspiracy ” was the echo of the great insurrection of 1857-58 in the region. 1891 A.D Govt. school at Bidar was made a High School. 29th August, 1911 The last member of Nizam dyansty Mir Osman Ali Khan, became the Nizam. 1922 Bidar Dist. Central co-operative Bank came into existence. 1st July 1932 The Railway line which passes through the Bidar district was opened for traffic. 17th Sept 1948 The Nizam announced on the radio about the surrender. The Nizam rule came to an end. Asafia Flag brought down. The Hyderabad state became a part of the Indian Union. 1952 Pandit Jawaharlal Nehru, Abdul Kalam Azad and Ku. Padmaja Nadu visited Bidar. 1955 Akhil Bharat Veershaiva Mahasabha held its sammelan at Basavakalyan. Sri Jayachamraj wadeyer, the then Governor of Mysore State laid the foundation of New Anubhava Mantappa Building. 21st March 1961 Bidar Shakar Sakkare Karkhana Ltd., a sugar factory was registered under the Karnataka co-operative societies act. 1961 B.V. Bhoomaraddi College, First Degree College started at Bidar. 26th Nov. 1969 B.S.S.K Ltd., at Hallikhed started its regular production. 1998 SHG movement started in a big way in Bidar District by DCC Bank Ltd., Bidar. 2002 Naranja Sugar Factory (Under Opt. Sector) started its regular production. PLACES OF TOURIST INTEREST IN BIDAR DISTRICT. Other places of interest Bidar District. The gleaming silver on black of Bidriware has a charm of its own. Few know that the art originated in Bidar, a small town in North Karnataka. R Krishna explores the science and people behind Bidri. Narsappa Nageshwar was a proud man when his elder son, Rajkumar, secured a seat in an engineering college. To his disappointment, Raj dropped out of college in the Second Year and returned to his first love – Bidri. Perhaps Raj’s grandfather, a master craftsman who had won a Sate award, would have been proud. For Bidri work is an ancestral craft passed from father to son. Raj’s family has now been carrying on the trade for close to a hundred years. Sturdy and almost unbreakable objects in various shapes and sizes, jet black in colour, Bidriware comes alive with dazzling silver inlay work. In fact, bidriware is similar to the Persian art of inlaying gold and silver in copper. According to the literature available, Persian immigrants taught this form of art to locals in Bidar during the reign of the Bahmanis. Though of Persian origin, down the ages, Bidri work has developed its own unique form and style. There are about 200 articles which are perennial bestsellers, including animals, boxes, idols, flower vases, photo frames, bed lights, jug shaped vessels, lamps, ash trays, paper weights and ornaments. Though the form of articles is common to all the houses that are into the making of this art in a commercial way, subtle variation in design makes them unique to the house it originates from. Though these design changes are not patented, every Bidri craftsman follows the code of honour – no copying of the design from another house. The making of Bidriware is quite interesting, involving a host of craftsmen who are adept at their skills. Bidriware is basically made of zinc and then treated with copper sulphate. The designer takes over at this stage of the process and marks the design of his choice using a grooving chisel before handing it over to the next skilled person. The design is chiselled further to make deeper grooves and silver wire is then inlaid inside these grooves. This unfinished showpiece is then buffed to make its surface smooth. Then starts the process that gives Bidri work its unique character. The soil found in the Bidar fort (which has oxidising properties) and Aluminium Oxide is mixed in water and boiled. The Bidriware is dipped in the boiling solution. The solution affects the zinc alloy, turning it black, while the inlaid silver retains its colour. The black and white bidriware is then cleaned and polished, before it is stacked in the shelves for sale. But, the life of those involved in the art is not easy. Bidri is a labour-intensive, time-consuming process. Adding to the burden is the spiralling cost of raw materials. A Bidri work, when it is ready, usually finds no takers in the town for its cost is prohibitive. There are no significant sales to tourists either as Bidar isn’t a popular tourist destination. As a result, direct sales form a very small percentage of the revenue. In fact, it is only 10 per cent, according to Raj. Exporters and city-based retailers who place orders as per the requirement are the primary customers for the local artisans. These middlemen, however, tend to give the local practitioners less than their fair share of money. After discounting all the expenses incurred in the making of Bidriware, Raj takes home only about Rs 12,000 – 15,000 a month. He supplements his earnings by selling other less expensive decorative ware popular amongst the locals. In spite of the low returns, Bidri trade employs close to 400 workers in this small town, earning wages ranging from Rs 1500 to Rs 4500 per month. Not every worker involved in this process is illiterate. Most children go to school until Class VII. It’s when the child fails to show an aptitude towards formal education that he drops out and takes up Bidri work. It’s ironic that school dropouts end up keeping this tradition alive. That doesn’t mean the hunger to do better is any less. Raj can sense the change in the wind outside his small town. Since most tourists flash credit cards these days, Raj is now trying to find out how safe the transaction through credit cards is. He has also heard about Internet and the advantage of reaching out to consumers, both in India and abroad, directly through the net. High on his priority list right now is, of course, providing for credit card deals. Meanwhile, he has compiled photographs which explain the Bidri process – ideal to woo the choice-spoilt 21st century tourist. And when he visited Dilli Haat last year, the album went with him on a CD. Raj is doing everything he can to pack that extra punch – he is even planning to print the whole Bidri process on the back of his visiting card! Narsappa is happy and proud, of course, but still feels that Raj should have pursued his course in engineering and taken up a ‘proper’ job. Raj and his band of dropouts, on the other hand, have put their heads down together, learning and adapting to the advances in the outside world in the best possible way. Abstract: This document provides general information about the Kannada language and conventions of its usage in computers. It provides information about the Input, Storage, Display and Printing of Kannada Characters. We strongly feel that this information gathered from various standards is necessary for the correct usage of the language in various applications of Kannada Language Computing. It also includes the sorting sequence for Kannada in Unicode. Note 2: The Convention followed in Unicode (Version 3.0) Chapter 9 (South and Southeast Asian Scripts) is used in this document and might differ from the notation commonly used in the Kannada Script.